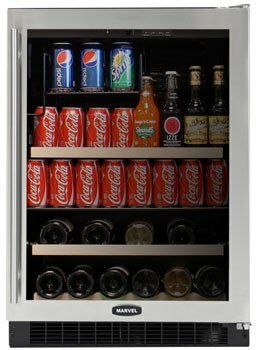 Beverage centers are the most popular type of under counter refrigerator. 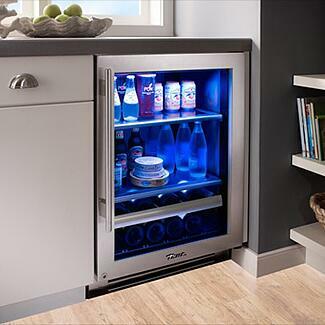 A beverage center is a combination of refrigerator space and wine storage. Generally they have one or two wine racks on the top or bottom and a single temperature zone. True and Marvel are two manufacturers with extensive refrigeration manufacturing backgrounds. True Professional Series is a division of True Manufacturing Company which has been an industry leader for over 65 years. You may recognize their logo from convenience stores and supermarkets beverage and food coolers. True has just recently jumped into the residential undercounter refrigeration segment with some pretty impressive products. Marvel was formed in 1932 when they started manufacturing undercounter ice boxes. Their wine cooler are consistently among the highest rated. Both brands manufacture their products here in the U.S.
We have both brands on display in our showroom and personally I like True better. The overall quality with a commercial stainless interior and shelving. The adjustable color schemes are also cool (my favorite is the blue). The best feature of the True unit is the rapid chill feature for when you need a rapid cool for beer, wine or any other items. 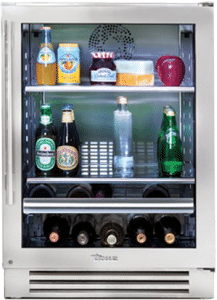 True is also the only beverage center completely convertible to a wine cooler, if needed. The warranty is also better at 3 years versus 1 for Marvel. Download the Yale Undercounter Refrigeration Guide with features, specs and inside buying tips to under counter refrigerators as well as ice makers. Over 45,000 people have read a Yale Guide.